If you like to wear short sleeve walking suits when casual is the dress of the day, You'll love that Montique makes some very stylish sets. Montique specializes in making mens dress outfits for the man who likes to match from head to toe and their walking suits reflect this. 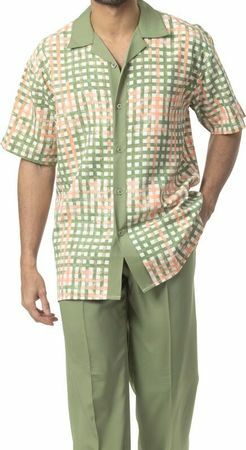 This short sleeve set features a green plaid pattern fabric with the matching pleated pants to match. Made of fine poly suit fabric.